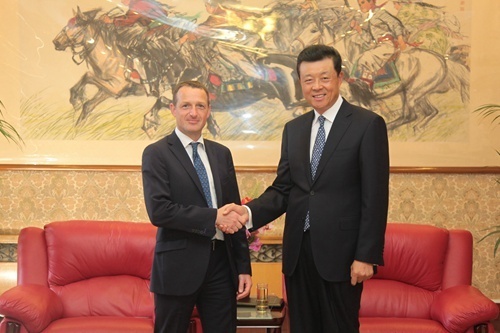 On 2 September, Ambassador Liu Xiaoming met at the Embassy with David Hallam, UK Envoy on the Post-2015 Development Agenda. The two sides exchanged views on the Post-2015 Development Agenda and other topics. Ambassador Liu said China attaches great importance to development. The international community should focus on eliminating poverty and promoting development, uphold "common but differentiated responsibilities", balance the three pillars of economy, society and environment, and facilitate the formulation of the Post-2015 Development Agenda. China is ready to work with the UK to actively participate in the negotiation process and promote common development and prosperity for all. Hallam said Britain regards China an important partner for development. The two sides have maintained good exchanges and cooperation in the formulation of the Post-2015 Development Agenda. Britain is willing to further strengthen communication with China to jointly seek early outcomes of the formulation of the Post-2015 Development Agenda.